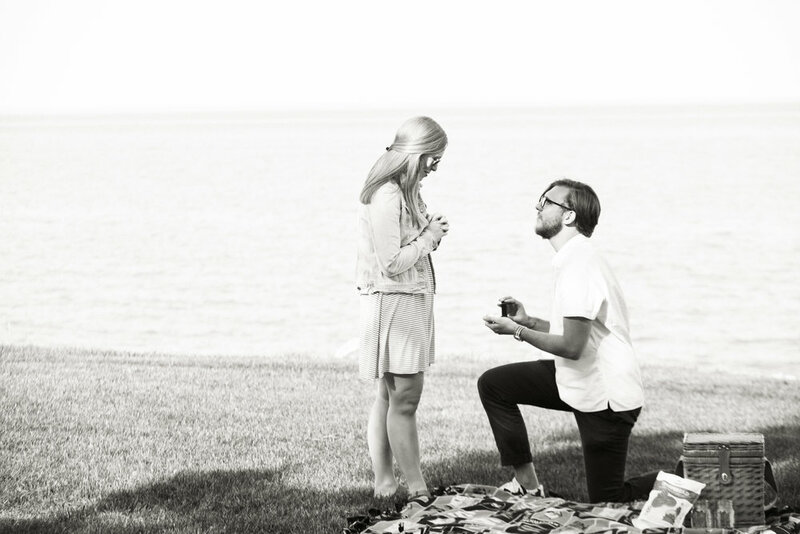 A few weeks ago, Garrett proposed to Krysta by the lake on Northwestern University's Campus and it was insanely wonderful. I was ecstatic to be able to help in Garrett's surprise because Krysta is such a sweet friend of ours. As we did our walkthrough, Garrett was explaining to me why he chose that particular location and what it meant to them. When the date finally arrived, Garrett had come over earlier in the day to deliver the picnic items and the ring. (Guys, I don't know how you hold on to those things so long and not panic 24/7.) Because Krysta had gotten off work early, we had a goal of making it a seamless transition for them to arrive and everything already be set up. So as I set the picnic up, I asked passers-by to stand in the spot so I could test my lighting (a lot). Surprisingly, folks were pretty gracious in helping me out. It was such a beautiful moment, and I was so honored to be a small part of it. Thank you Krysta and Garrett for allowing me to celebrate with you! I asked them if they'd like to share a story about how they met, and they each wrote it up from their perspective.